Colors hold significance for people around the world. Not only do colors influence emotion, but they also hold meaning in religion and various cultures. On this page you will get answers to questions like, "What does the color red symbolize?" This question is answered differently depending on where you are located in the world. If you don't see what you are looking for on this page, please put your questions in the comments section at the bottom of this page. Traffic lights: Red means stop, yellow means caution, and green means go. Yellow signs also warn drivers of upcoming curves, pedestrian crossings, and animal crossings. Most, if not all countries have a flag. The colors of each flag are usually seen as patriotic. Red, white, and blue symbolizes patriotism in the U.S.A.
Red and green are favorite Christmas colours. Colors of Autumn such as orange, brown, yellow and red are associated with Thanksgiving with black and orange associated with Halloween. Pastel colors are used for Easter. Because flowers are a common gift for Mother's Day, colors such as yellow, pink, and red are used frequently. Pink symbolizes love and romance, caring, tenderness, acceptance and calm. Beige and ivory symbolize unification. Ivory symbolizes quiet and pleasantness. Beige symbolizes calm and simplicity. Yellow signifies joy, happiness, betrayal, optimism, idealism, imagination, hope, sunshine, summer, gold, philosophy, dishonesty, cowardice, jealousy, covetousness, deceit, illness, hazard and friendship. Dark Blue: Symbolizes integrity, knowledge, power, and seriousness. Blue: Peace, tranquility, cold, calm, stability, harmony, unity, trust, truth, confidence, conservatism, security, cleanliness, order, loyalty, sky, water, technology, depression, appetite suppressant. Turquoise symbolizes calm. Teal symbolizes sophistication. Aquamarine symbolizes water. Lighter turquoise has a feminine appeal. Purple: Royalty, nobility, spirituality, ceremony, mysterious, transformation, wisdom, enlightenment, cruelty, honor, arrogance, mourning, temperance. Lavender symbolizes femininity, grace and elegance. Orange: Energy, balance, enthusiasm, warmth, vibrant, expansive, flamboyant, demanding of attention. Green: Nature, environment, healthy, good luck, renewal, youth, spring, generosity, fertility, jealousy, service, inexperience, envy, misfortune, vigor. Brown: Earth, stability, hearth, home, outdoors, reliability, comfort, endurance, simplicity, and comfort. Gray: Security, reliability, intelligence, staid, modesty, dignity, maturity, solid, conservative, practical, old age, sadness, boring. Silver symbolizes calm. White: Reverence, purity, birth, simplicity, cleanliness, peace, humility, precision, innocence, youth, winter, snow, good, sterility, marriage (Western cultures), death (Eastern cultures), cold, clinical. Black: Power, sexuality, sophistication, formality, elegance, wealth, mystery, fear, evil, unhappiness, depth, style, sadness, remorse, anger, anonymity, underground, good technical color, mourning, death (Western cultures), austerity, detachment. Marriage: White and pink are favorite just as in the western world. Evil or sadness- Just like in the western world- black. Blue is seen as conservative. Red is power and aggression. Brighter colors such as yellow and orange represent warmth not only with emotions but also with temperature. Cool colors are blue, green, black or any color with a dark shade. When someone is feeling down or depressed, it is said they are feeling "blue." When someone is angry they "see red." When someone is seen to be afraid or "chicken" they are called "yellow." Obviously green is the major color symbolizing ecology. The new phrase for people or companies who find ways to cut back on electricity, fuel, or things that damage the environment is "going green." When something is seen as opposite, extreme, or a firm position, it is said to be "black or white." When something is not clear or not in a firm position, it is said to be a "gray area." The blues describe a form of music. Colors are sometimes used in therapy (Also called Chromotherapy). Colors have a huge effect on people who have brain disorders or who are emotionally troubled. The color blue has a calming effect on many people and lowers respiration and blood pressure. Red has the opposite effect. Some therapists use green to sooth and relax emotionally disturbed people who suffer from anxiety or depression. Some claim that the color violet is good for migraines and in "cases of cellulitis caused by a poor elimination, heaviness or sluggishness after eating, disorders of the spleen, bladder and kidney." Yellow helps energize people and relieves depression. Color means many different things to different people and cultures. We all have our own favorite colors. People like different colors like they like different foods. Color also represents feelings, people, countries, cultures, and color symbolism. In the western world, the color red is seen frequently of symbolizing anger or aggression. Some car insurance companies charge more for red cars because some of the owners of red cars are more aggressive or take more risks. Black: The History of a Color - Black-- favorite color of priests and penitents, artists and ascetics, fashion designers and fascists- has always stood for powerfully opposed ideas: authority and humility, sin and holiness, rebellion and conformity, wealth and poverty, good and bad. In this illustrated book, the acclaimed author of "Blue" now tells the fascinating social history of the color black in Europe. Color and Meaning: Art, Science, and Symbolism - Does color have an effect on our feelings? The phenomenon of color is examined in new ways in John Gage's latest book. His study is informed by the conviction that color is a contingent, historical occurrence whose meaning, like language, lies in the particular contexts in which it is experienced and interpreted. Veiled Brightness: A History of Ancient Maya Color - Veiled Brightness reconstructs what color meant to the ancient Maya, a set of linked peoples and societies who flourished in and around the Yucatan Peninsula of Mexico and Central America. By using insights from archaeology, linguistics, art history, and conservation, the book charts over two millennium of color use in a region celebrated for its aesthetic refinement and high degree of craftsmanship. Pantone Guide to Communicating with Color - This authoritative guide presents hundreds of color combinations and color principles needed to create effective designs. Every lesson is demonstrated by example, enabling designers of all specialties and levels of experience to make the best color choices for every type of design. Art Inspired Colour - See a slide show on colour and read more about colour. Color Fun - Integrate art, science, and writing with these color-filled activities. Elimy Gems - This site includes color symbolism as well a how it relates to gems. Flower Symbolism - This page explains what flowers symbolize as well as the color of certain flowers. Below you see a visual that illustrates the use of color in logo design. 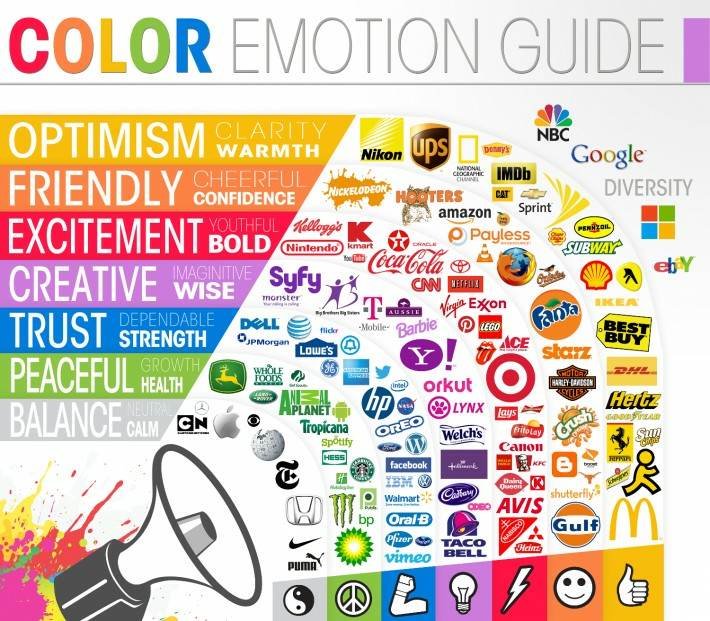 Each company wants to stimulate a specific emotion from customers and they use color as one of the main ingredients. How successful do you think these companies are at transforming your feelings about them?